Tuesday got off to a rough start for a Springbrook, Alta., woman on her way to work after her car was stolen at gunpoint in what RCMP say is a week-long crime saga. A Springbrook, Alta., woman experienced the most Canadian of carjackings on Tuesday, which saw a thief with a gun return her purse, phone and lunch then apologize before taking off in her vehicle. 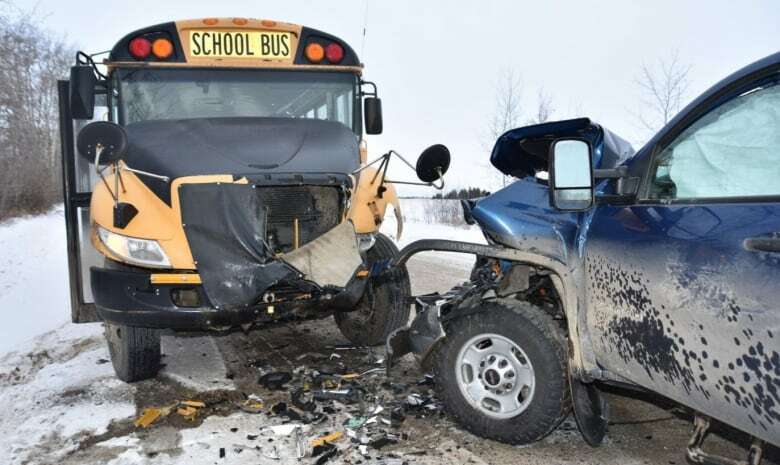 The woman was on her way to work, driving near the Red Deer airport, about 130 kilometres north of Calgary, when she came across a collision between a pickup truck and a school bus. One of the drivers was standing on the road, so the woman stopped and got out to see if he needed help. At first, the man didn't respond to her. "And that's when he turned further and I saw he had a bandana over his face," the woman — whom the CBC is calling Jennifer — told the Calgary Eyeopener on Wednesday. "He didn't say anything. He just kind of groaned and started walking toward my vehicle. At that point I knew something was definitely not OK, so I asked him, 'What are you doing?' and I started to run back toward my vehicle. "And he started running. Then he pulled out a gun, so I just stopped, and I put my hands up and was like, 'It's yours.'" The man then stole the woman's vehicle, but not before asking a couple questions of his own. "He asked if I had any children in the back of the vehicle. I said no. Then he asked me if there was anything I needed, like my phone, and I said 'Yes, if you're going to leave me in –20 C on a gravel road, I would appreciate my phone,' so he gave me my phone, my purse and my lunchbag." 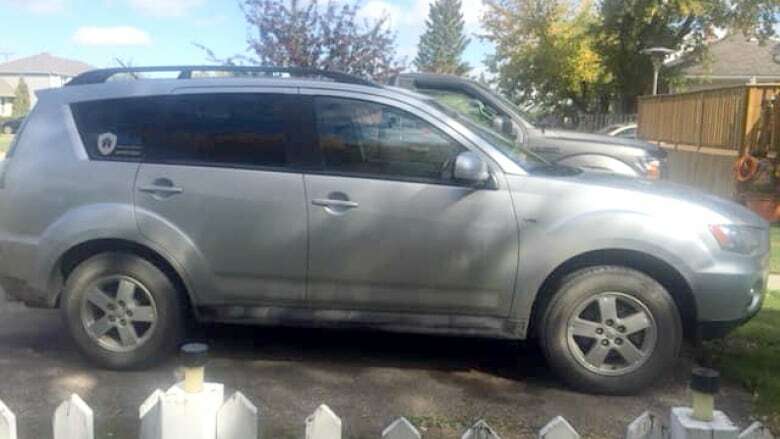 The man then took off in the woman's vehicle, a 2012 silver Mitsubishi Outlander with Alberta licence plate BNR 6558, which police are now searching for, but not before apologizing. "I said, 'Thank you [for returning her things],' and he said, 'I'm sorry,' and I said, 'That's fine.' I guess it was just a reaction because he was stealing my car and had a gun in my face," she said. The vehicle has cat decals in the rear window which will help identify it, RCMP Cpl. Laurel Scott told the Eyeopener. The carjacking was part of a string of incidents police believe began a week earlier, said Scott. On Jan. 15, two men in a stolen Ford F-350 broke into a Fountain Tire in Drumheller, Alta., using the truck to ram through a service bay door, where they stole another truck. "My assistant manager saw it all on his phone through the video cameras we have on site ," said Joanna Hodgson, owner and manager of the Fountain Tire. "It was a little alarming for sure." Hodgson said the thieves were in and out of the building in less than 10 minutes and left extensive damage to the bay door. The F-350 was later located by police in the Stettler area, roughly 100 kilometres north of Drumheller, and a man was taken into custody. Then in the early morning hours of Jan. 16, the stolen Fountain Tire truck was used during a break and enter at a gas station in Bashaw, northeast of Red Deer. "It was seen to drive into the Esso building, cause damage … and the male suspect went into the Esso and stole some items and left in that stolen Fountain Tire truck," said Scott. A few hours later, the same truck was spotted at a business in Delburne, also east of Red Deer, where a man was trying to steal gas. "He drove away in the truck, but before leaving the area, he fired some shots," said Scott. "The man who reported it to us thought there were at least three shots fired." Scott said police don't know whether the man was firing warning shots. There were no further reports involving the truck until the crash with the school bus on Tuesday. Scott said seven children were on the school bus, which was carrying students from kindergarten to Grade 12 to several schools in Penhold. No injuries were reported. The first man arrested has not been co-operative with police, so they have no information on a suspect. Adding another layer is the fact the stolen Mitsubishi needs a key fob — which Jennifer still has — to restart after it's shut off. "That's the information she gave us … so either he would have to gas up with it running, or we anticipate it will be abandoned somewhere." Scott said if members of the public see someone in the Outlander, they shouldn't approach and should instead dial 911.